The Ministry of Environment and Forests has exhibited great readiness in notifying eco-sensitive zones around all national parks and wildlife sanctuaries in the country. But the ministry does not seem to be as committed about implementing these notifications. In one such case where the no development zone was declared near Kaziranga National Park in Assam, which was being constantly violated by various industries for over a decade, the ministry has tried to shrug away its responsibility, saying it cannot be held liable if the notification issued by it is not implemented on ground. MoEF had declared an area along the eastern boundary of Kaziranga as a “no-development zone” in 1996. But the state had allowed more than 100 industrial units, including stone crushers, tea factories and brick kilns, to operate in and around this zone. In September last year, the National Green Tribunal ordered shut all industrial units operating inside the restricted zone. It has also imposed a penalty of Rs 1 lakh each on the Union Ministry of Environment and Forests (MoEF) and the state for allowing violations in the eco-sensitive zone. Interestingly, the ministry had admitted to the tribunal that it was not aware of the violations. The ministry tried to evade its responsibility by passing the buck to the state government. It said the copy of the eco-sensitive zone notification was sent to the state government and that it was up to the state authorities to ensure its implementation. “If any violation was brought to the notice of the MoEF, the matter could have got enquired through the regional office of the ministry at Shillong,” it told the court. MoEF has six regional offices across the country to monitor implementation of its programmes and rules but they have often proved inefficient due to lack of staff and resources. 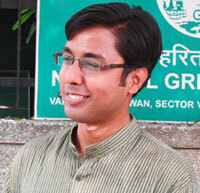 “It is unfortunate the MoEF is shying away from taking the responsibility for what happened in Kaziranga. While it is unable to monitor the implementation of the existing ESZs, it is pressing the states hard to notify ESZs around all the national parks and sanctuaries. I wonder what will be the fate of those notifications,” said Rohit Chaudhary, an RTI activist who had approached NGT against the violations of eco-sensitive zone in Kaziranga.